Height 12 1/2"/31 cm. The estimated value on this item is driven not only by age but by the popularity of goat-themed items, which drives prices up even on eBay. Also made as Zaphir. Unnamed sculptor for this item is probably the same as for #522 below. Also made as Zaphir. Unnamed sculptor for this item is probably thee same as for #521 above. Sculptor: García M-1991, G-2006 $55 last retail $65-$75 Little girl in white nightdress cuddling small puppy against her chest. Also made as Zaphir (see Zaphir catalog). 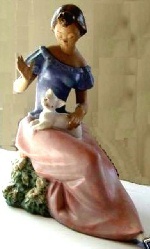 Sculptor: José Roig 1984 $125 $135-$150 Young girl in long-sleeved blue shirt, white hat tied under her chin, bag slung over right shoulder, kneeling and holding greens out to two small rabbits. Also made as Zaphir (see Zaphir catalog). 13"/33 cm). Also made as Zaphir (see Zaphir catalog). Sculptor: José Puche 1991 $300 $350-$375 Shepherd girl holding staff and leaning on her raised knee, two white goats (one with horns) either side of her, whole grouping raised on piled rocks. Although this item was expensive for a NAO at retail, its estimated secondary market value remains high because of the popularity of goat-themed collectibles, which drives prices up even on eBay. Also made as Zaphir. Sculptor: Puche 1985 $325 $350-$375 Same as #700 only in a "hybrid" special finish with enamel paint similar to Gres, horned goat in brown. Also made as Zaphir. Estimated secondary market value on this item is a function of the popularity of goat-themed colelctibles, which tends to drive prices up evenon eBay.